B-Kyu: Paris ~ What's Vietnamese Food Like in Paris? What if Ho Chi Minh had written about his time as a cook in France and the USA as 'Down in Out in Paris and New York'? Much has changed for Vietnamese migrants in Paris since then, even Luke Nguyen has family here running a restaurant. We had to drop in and say g'day. 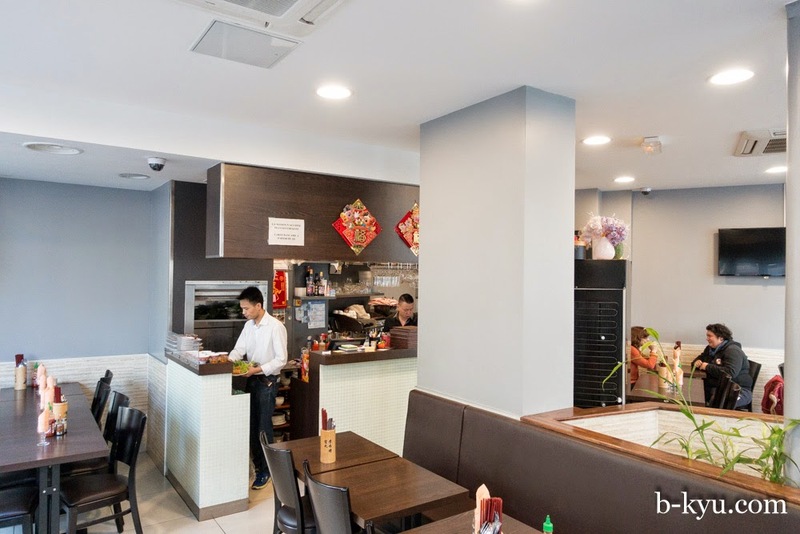 There are plenty of Vietnamese restaurants across Paris where the largest Vietnamese community in France is settled. We head down to the Quarter Asiatique for a first investigation, hoping to find some lovely French and Vietnamese mix ups of flavours and food styles. Kok was our choice for a pho on a coldish Paris day, mostly because it was one of the first ones we came to. The name helped too. After we ordered our food, the Chinese speaking blokes on the table next to us get soup with big hunks of corned beef on the side. It seemed to be the speciality of the place. Mass jealousy ensues. As we looked around the people on the other side of us were trying it as well, guess we should have waited a little before we ordered. The soups are served with strong mint and sawtooth herb, a little sweet. 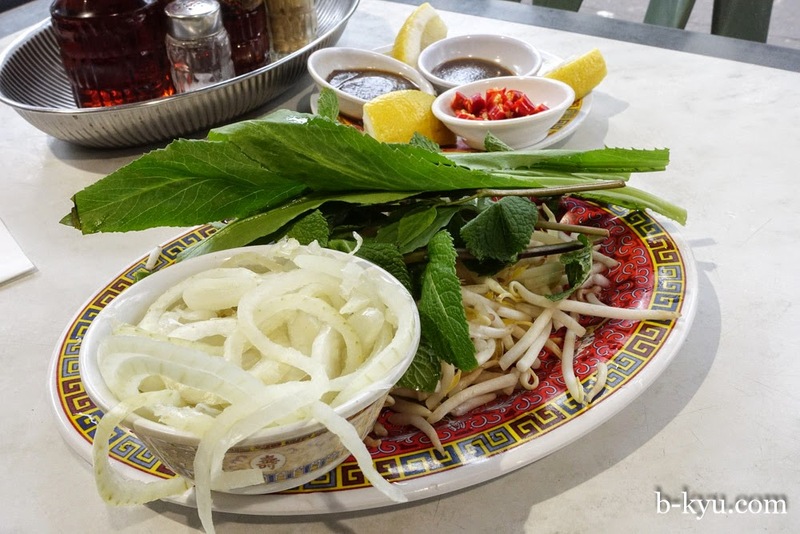 Onions were lightly and sweetly pickled to take the edge off them, and a good serve of fresh chopped chilli, hoisin and fresh lemon were served as extra fixins. The beef special pho was full of all the glorious bits you would expect like tendon, beef balls and tripe. 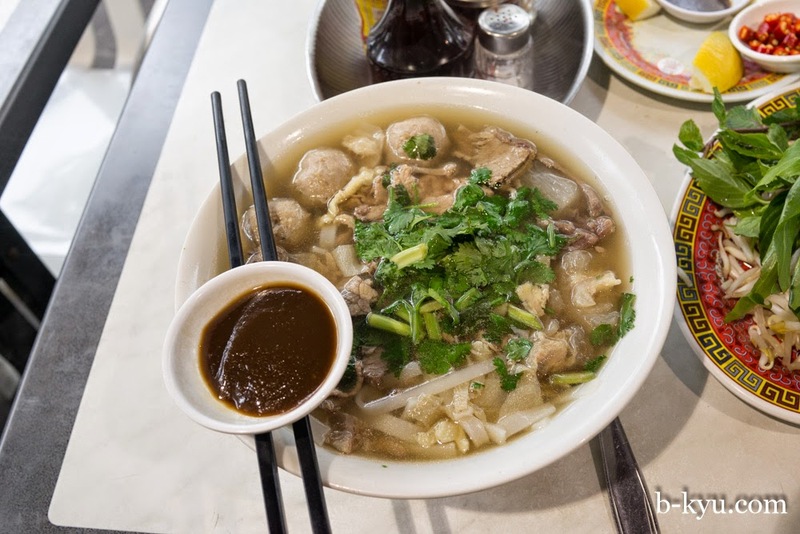 A hearty, meat filled, man sized regular old pho with a heavier broth. There was a Chinese influence to the cooking (perhaps this place has some Chinese people in the kitchen too). We needed to get some more Vietnamese meals in in to make a comparison and find that French touch. 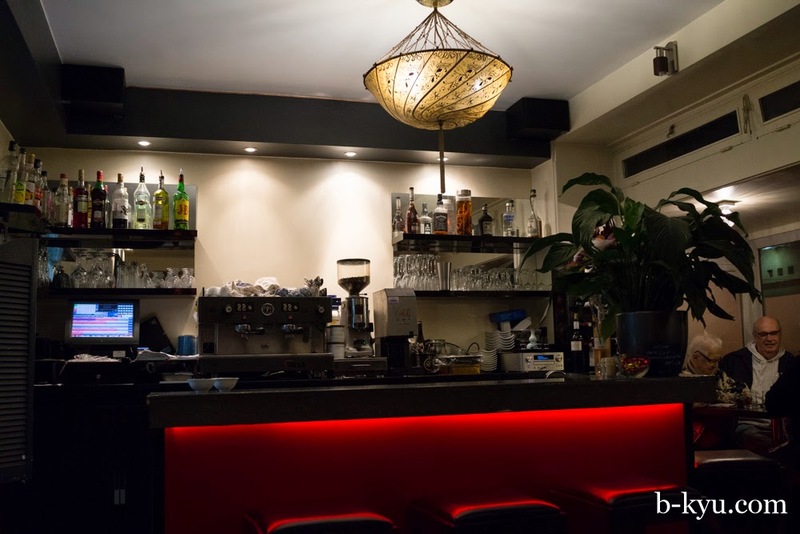 Kok is at 129 Bis Avenue de Choisy, 75013. Travelling with a Francophile makes it hard to get out and convince them of some alternate non-French food dining. We hate to admit it but when we mentioned a 'famous-on-TV' restaurant as a possible night out we got some interest, so we made the leap of faith to try it. 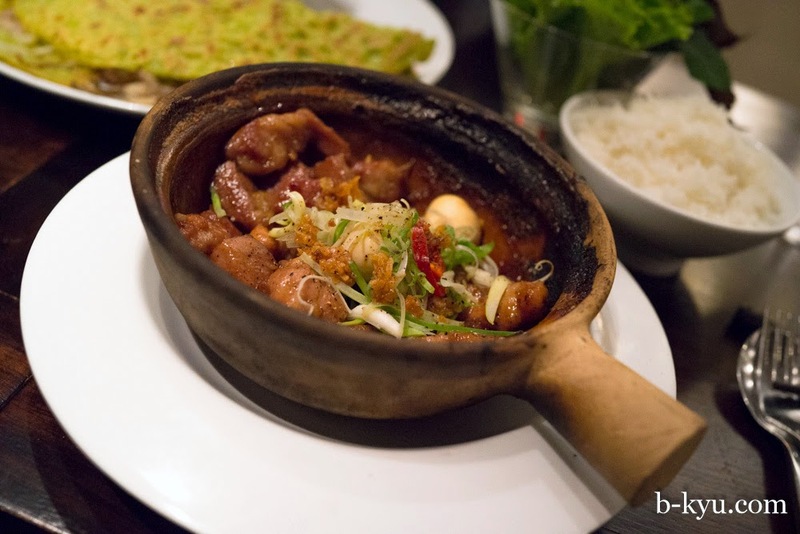 Bistro Indochine is owned by Luke Nguyen's cousin and featured in his series on France. We didn't know what to expect, it's a nice little restaurant, not flash but a step up from your average bistro. The boss man is super friendly and service is so attentive, we're a little taken a back from all the attention. The place fills up so we were lucky to get a table, we recommend booking if you had a group or wanted to make sure of a table for the night. The break from French food made us all feel happy, which is kind of sad but telling. Asian food is just such a big part of the Australian way of eating that even Shawn's Mum was pleased to have something different for the night. The potential for some fine Vietnamese food mixed with French influence was a star drawcard for us. 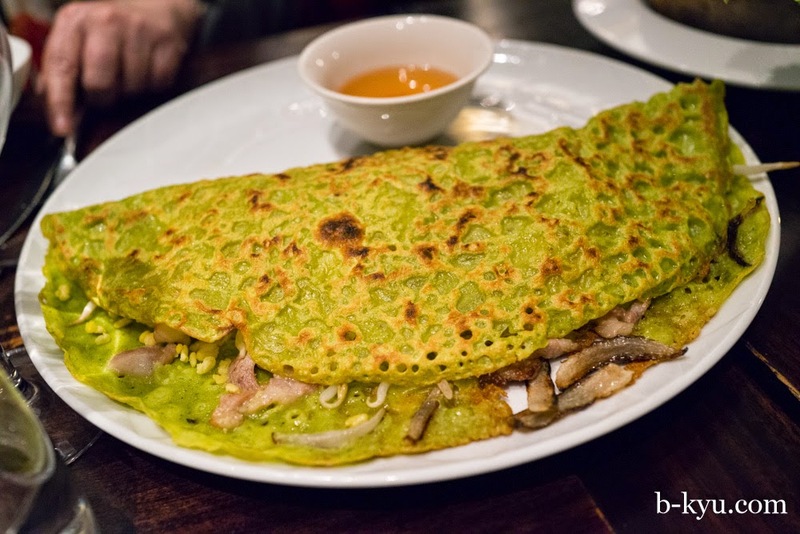 The ban xeo (pancake) is bigger than we are used to and is green, possibly flavoured with pandan. Light and crisp outside and filled with pork, prawn and bean spouts. Rip off a hunk and wrap it up with lettuce and mint and dunk it in chilli sauce. 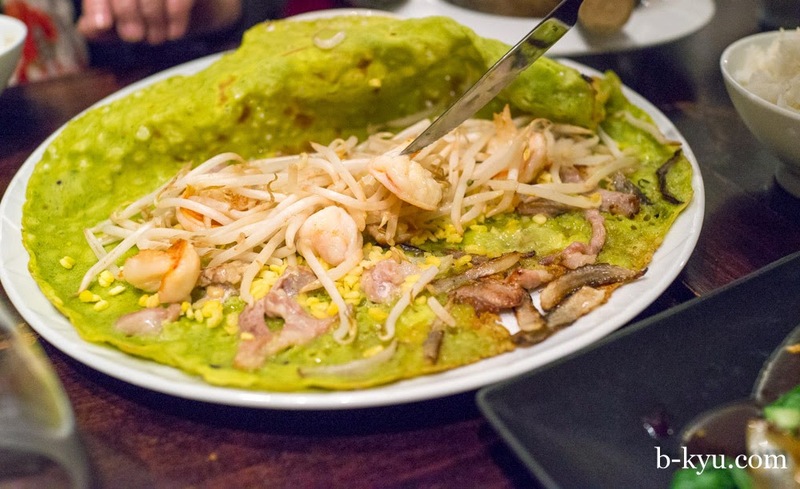 Pancake innards, big prawns, plenty of bean sprouts and some slices of bacon. 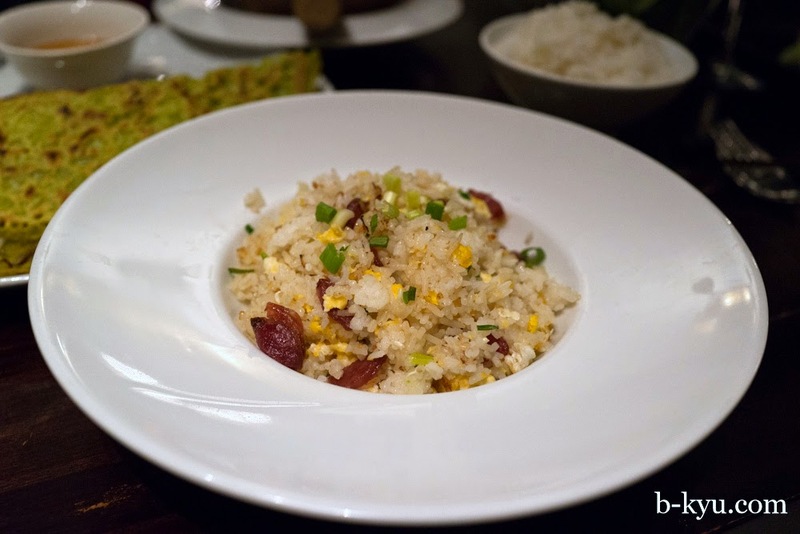 Fried rice, how we missed you! 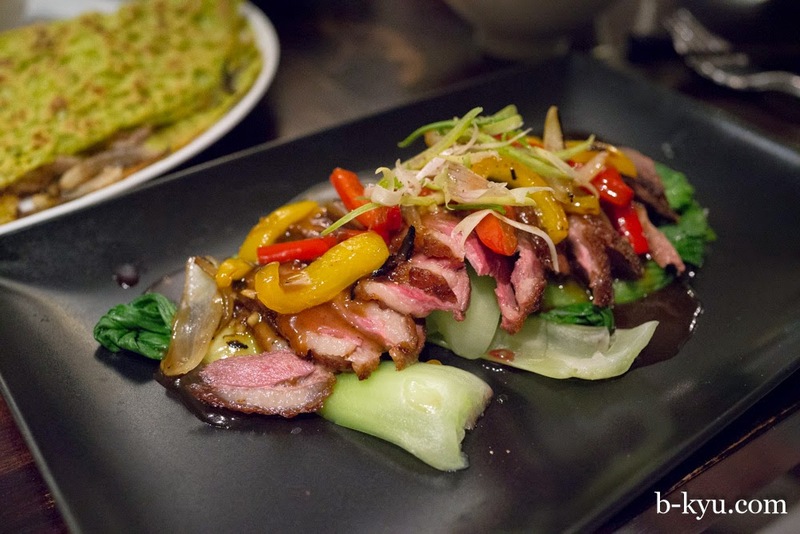 A roasted duck breast is superb, cooked pink and juicy in the middle on top of a pool of sweet tamarind sauce, that didn't drown out the flavours of the dish. The duck wasn't as gamey like other ducks we had on this trip, much loved. The bed of coloured vegetables soaked through with the duck juice and sauce. Classic dish of pork cooked in a clay hotpot with sweet caramel sauce, there was a nice fish saucey kick to it too. Half the fun of this dish if fighting to scrape all the bits off the bottom of the pot. There's Vietnamese beer served here (the import version of 333) and a good wine range too. We should only eat French food on our last 48 hours in Paris but sometimes you just need a pho. We can travel for weeks in Asia without a western meal but we can't do it in reverse. Our tired hungover protein overloaded souls needed some soup. 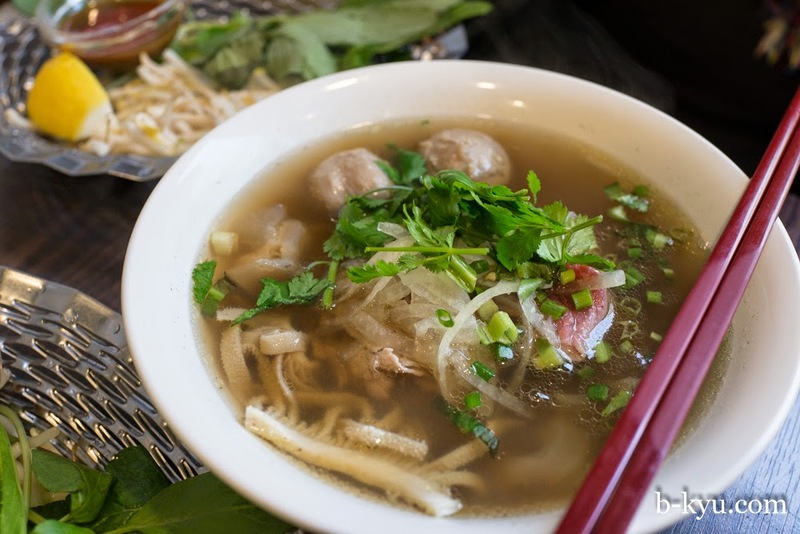 We spied Asian Soupe during an earlier recon around the Belleville area. The same lady was standing out the front of the shop as the last time we were here. Maybe she's a very friendly lady looking for friends. There's a lot of nice ladies looking for friends around here. Super tidy space inside, we imagine this fit out is pretty new. The pho here was good, an honest, sweet, meaty broth. 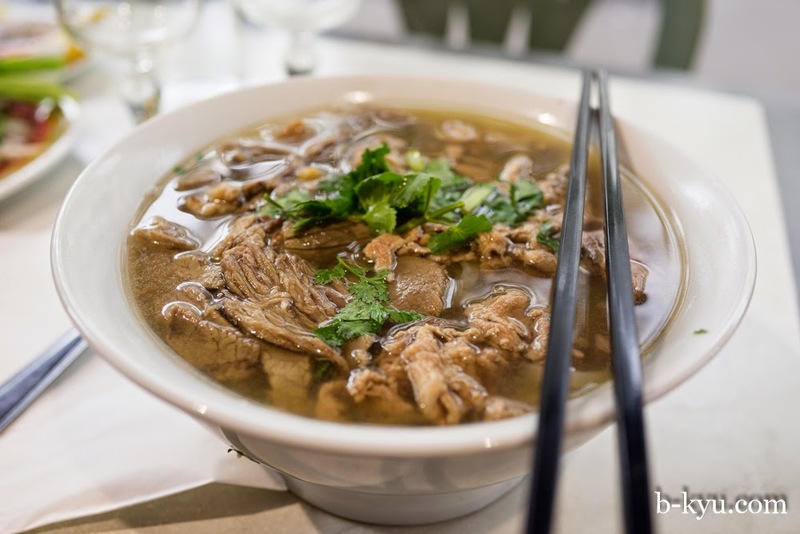 The beef is pink and rice noodles are thin and flat, swirls of thin sliced onion float along the top. 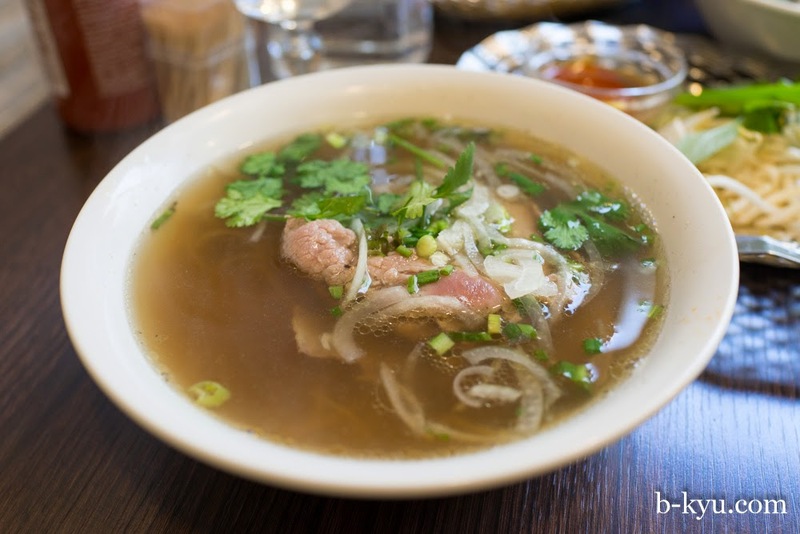 The great thing about pho is it changes little wherever you go, it's so reliable, it's the Big Mac of noodle soups. Alison gets extra guts and meatballs, her guts are super happy. 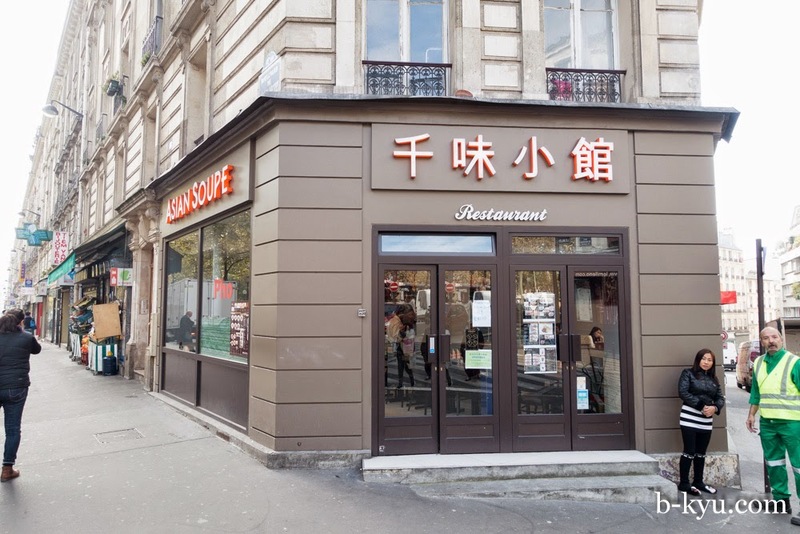 Asian Soupe is at 25 boulevard De La Villette, 75019 Paris. We love Vietnamese food and Paris! Re. "The same lady was standing out the front of the shop as the last time we were here. Maybe she's a very friendly lady looking for friends. There's a lot of nice ladies looking for friends around here." Did Alison approve of all the new friendships that Shawn had developed? The renowned street photographer Henri Cartier-Bresson would have used your photograph as a fine example of "The Decisive Moment". You photographic prowess never ceases to amaze me. Looks great! 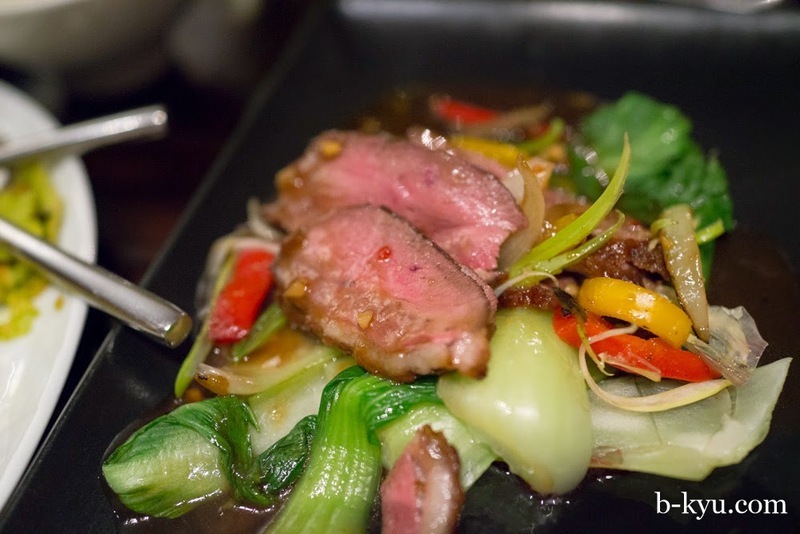 I recently tried Vietnamese food in Shanghai! It's nice to her how much you guys love Asian food, the culture is not quite the same in UK.